The German Embassy in Lusaka recently moved to new premises leaving the building it has occupied since the 1970s vacant. 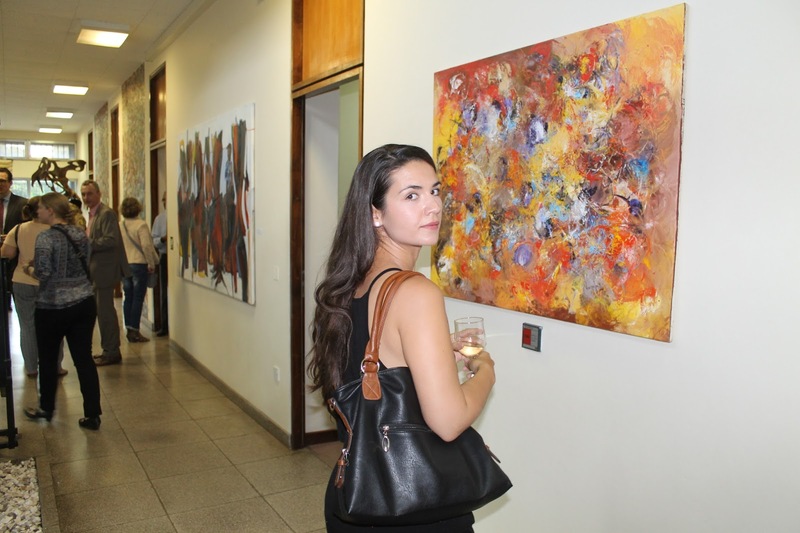 The old embassy building is in fact up for sale but before any transaction has come forth, the German mission decided to host an exhibition of contemporary Zambian art from 15 to 29 March. The idea to hold an exhibition was essentially in order to pay tribute to “African Market”, a 1977 mural (wall painting) by Henry Tayali and offer the public access to visit the masterpiece created by one of Zambia’s pioneer artists. According to the German embassy, also it saw the exhibition as a great opportunity to display the work of artists that it collaborated with as well as others who are linked to Tayali. 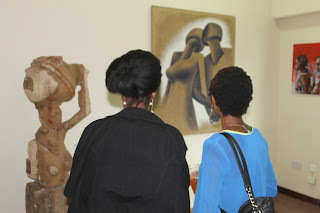 The exhibition was curated by William B. Miko working together with Stary Mwaba and the author. Entitled Visual Voices, the exhibition featured Zambian artists of various ages and career levels, in comparison the youngest is only 22 years old while the oldest is 73, the majority are self-taught, while the most educated has a Master of Fine Arts such is the broad difference between them. What amalgamates them; however is that they collectively possess an outstanding creative proficiency in painting, sculpture and multi-media installations and their work speaks directly to issues of everyday life, traditional rituals, sexuality, family love and politics. 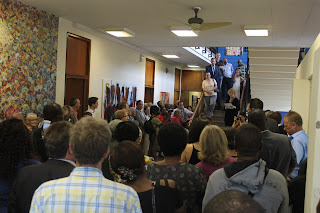 In her opening remarks during the launch on Tuesday last week, the German embassy’s Head of Cultural Division, Isolde Aust stated that Tayali´s painting at the old embassy attests to the time when Zambia and Germany broke new grounds in their collaboration in the field of art and regular exchange between artists that continues up to today. “We highly appreciate Zambian art - old and new - its diversity and energy, as well as the existing initiatives of artists which fortunately have been increasing over the last years. 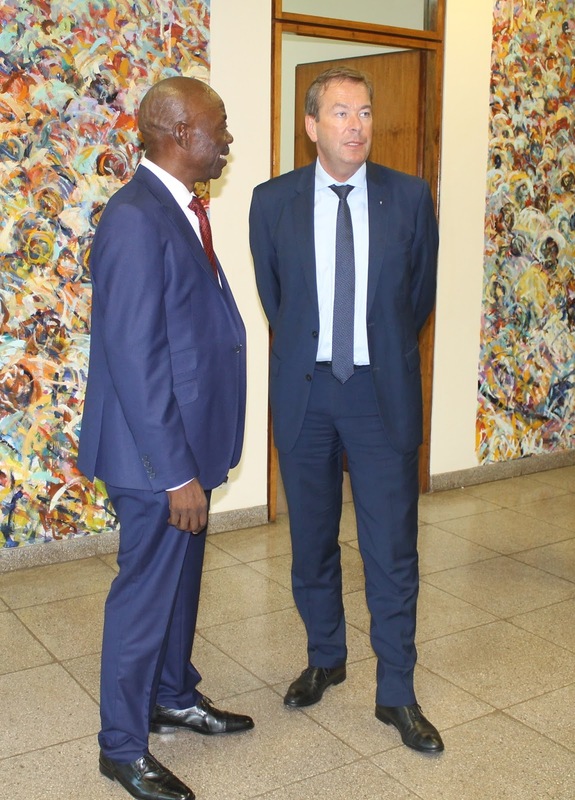 The German Embassy itself joined in the effort of creating a space for Zambian artists by displaying selected works in the virtual grounds of an online gallery on our website,” said Aust. In his curators note, Miko indicated that he did not have it easy when selecting works for the exhibition citing too many artists to choose from and therefore a lot that could have been included were left out. Eventually only 25 artists were featured in the show, namely Henry Tayali, Style Kunda, Vincentio Phiri, Rabson Phiri, Agnes Buya Yombwe, Mabvuto Mwanza, Njalika Chongwe, Mulenga Chafilwa, Ng’andwe Mwaba, Lombe Nsama, Lawrence Yombwe, Nsofwa Bowa, Flinto Chandia, Mwamba Mulangala, Patrick Mumba, Zenzele Chulu, Bisalom Martin Phiri, Tom Phiri, “Ziggy” Daka, Katwishi Tayali, Charles Chambata, Geoffrey Phiri, Stary Mwaba, Enock Ilunga, Linda Chandia and Charles Chambata. Nonetheless, Miko stated artists will always remain a natural barometer of the past, present and future epochs pointing out that this is how the viewer reads the social temperature and gauges society’s intellect. “The ‘Visual Voices’ is an art exhibition conceived to showcase what Zambia has to offer to the world in the discipline of visual arts and its creative processes. 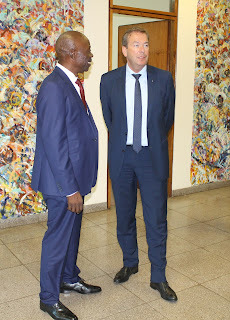 The primary purpose of this exhibition is to showcase a trajectory of art development and indeed to celebrate the existence of the two artworks that are permanently located at this former German Embassy building,” declared Miko. During the exhibition the said Tayali artworks that are permanently attached to the wall were accompanied by over 140 individual pieces spread across 15 rooms in the one storey building. The lawns and driveway also had an array of metal and stone sculptures that lent company to a 2003 work by Charles Chambata entitled “People coming out of nature to create a new world” that features concrete sculptures emerging from what seems to be a partially decaying tree. Clearly on borrowed time, if only for a few days, the display gave the implicit feel of a national art gallery in Lusaka, something that has been lacking for years and remains hoplessly elusive, a predicament that has for decades now, been compounded by the vexed question of funding towards the visual arts, both public and private despite seemingly positive lip-service with regards a revised cultural policy as well as general investment in the development of arts and culture infrastructure countrywide. Nevertheless, the Visual Voices exhibition attracted a diverse range of people from foreign dignitaries attending the Inter-Parliamentary Union international conference to local school children from Woodford School in Lusaka. It was visited by the likes of President of the German Parliament, Dr. Norbert Lammert, Vice-President Claudia Roth and Sub-Committee on Foreign Cultural and Educational Policies, Dr. Bernd Fabritius who were all fascinated with the display. The old German Embassy building is still up for sale awaiting purchasers, animating suspense as to what will happen to the immovable 1977 Henry Tayali painting in its foyer and the 2003 tree sculpture by Charles Chambata on the lawns. Obviously there can be no instructing whoever will purchase the building to desist from dismantling it wherever and however they so wish. All in all, the Visual Voices was surely an outstanding display of contemporary Zambian which would have been ideal to be left hanging a little while longer, so that at least more people could see it. As a curator Miko had really outdone himself concerning the display and mounting of the show, however, in retrospect one might observe that it felt to a certain extent like an extension of the Lechwe Trust Collection which to anyone who has been watching the Zambian art scene for years should not come as a surprise seeing he is the Trust’s chairman and is involved in its selection of works. It is perhaps against this backdrop that one can feel there were a bit too many Agness and Lawrence Yombwes, Mulenga Cafilwas and Style Kundas on display. Copies of the “Visual Voices” exhibition catalogue are available for purchase at K120 from the Henry Tayali Gallery at the Visual Arts Council in Lusaka, the Zambia Open University Makeni Campus, Twaya-Art Gallery at the Lusaka Intercontinental and the Lusaka National Museum. The publication features 25 artists biographies, a Foreword by German Ambassador to Zambia Bernd Finke and Isolde Aust (Head of Cultural Division), a Curator’s Statement by William Miko, plus Preface and 25 artists’ biographies by Andrew Mulenga and poem by sculptor, Charles Chambata. The Preface, provides an updated overview of the contemporary Zambian art scene. 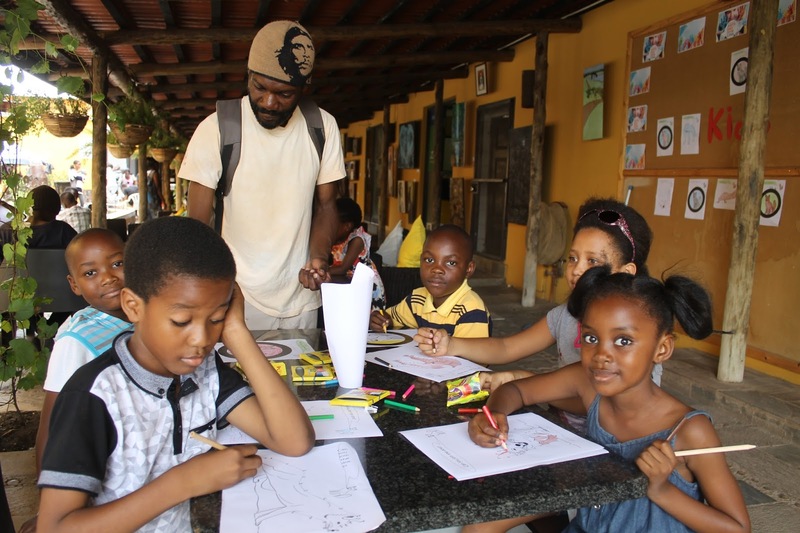 The Amos Youth Centre (AYC), a leading educational non-profit organization with a focus on supporting disadvantaged children and youth based in Kafue recently added an art initiative to their many learning programmes. The centre, which is located in Shikoswe Township, has various programs among them a feeding programme, computer tuitions, a spelling bee, chess, JETS, poetry, drama, and culture clubs. 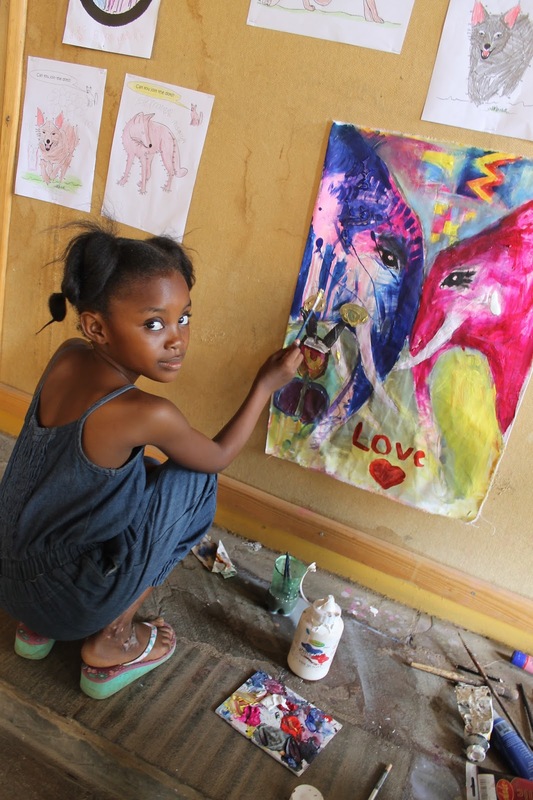 The new art programme is being supported by ArtSPROUTS an international organisation that facilitates after school program that fosters education and appreciation for the arts, and provides tools for creative self-expression and leadership. 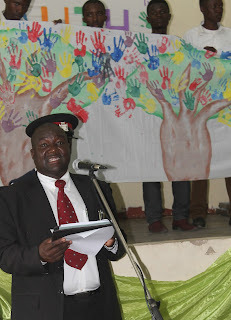 Officiating at the launch, guest of honour Kafue acting District Commissioner Ngoni Moyo expressed excitement at the private initiative stating it was in line with government’s effort to prioritize the reach of art and culture throughout the country. “Our government has come with career paths in secondary schools so that more children have access to skills in art and other fields,” he said. He added that government has observed that it is time to show commitment towards developing an art sector and market Zambia to enhance economic empowerment for the youths, stressing that in the hands of children and the youth, art can create a lifetime advantage to communities the Zambian nation and the African region at large. “Access to arts at a young age creates our future architects, engineers, artists, industrial designers, art historians, graphic designers and cultural representatives”, he said. Moyo declared that the vision of the government in promoting art and culture has also been echoed in the Patriotic Front party’s manifesto on page 26 stating the desire to encourage public and private investment in the development of arts and culture infrastructure in cities, towns and villages. Speaking at the same event AYC Director Frederick Kamanya said the addition of the arts in conjunction with artSprouts encompasses the centre’s holistic approach in respect of education. He went on to elaborate on many more of the AYC’s projects, with particular emphasis on its long running scholarship programme. “Another important aspect of our work is the Sponsorship program. 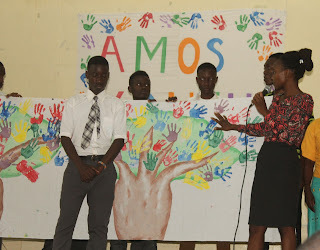 It started in 2007 when Amos sponsored 25 secondary school pupils. Every year since then, the number of beneficiaries has increased. 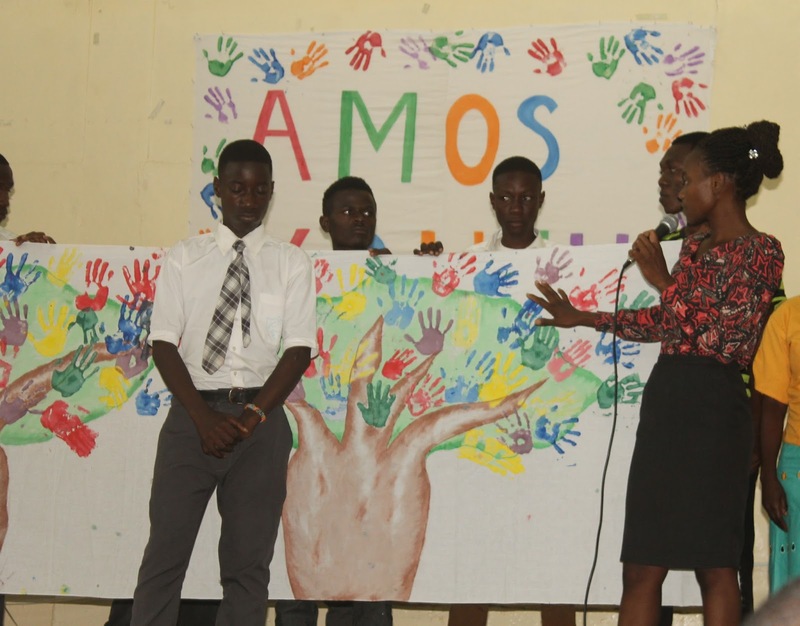 For the 2016 school year, 193 of Amos most vulnerable members have received a sponsorship to attend various secondary schools. 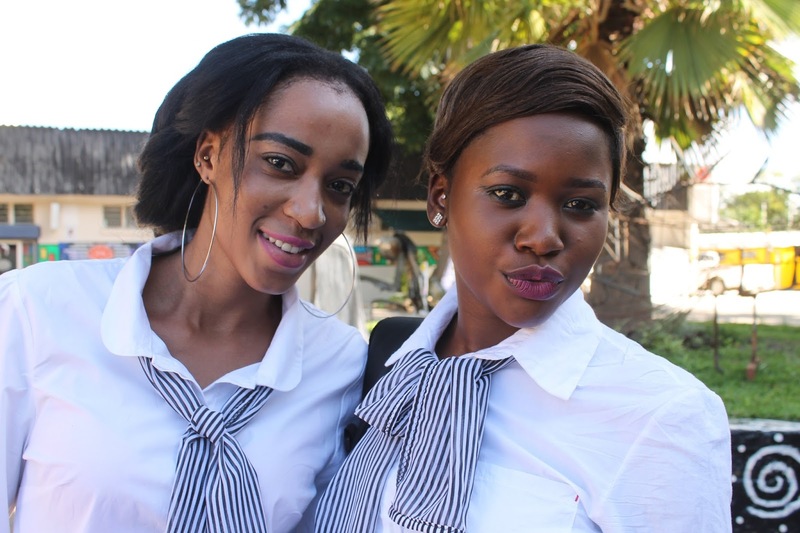 Also 38 students are attending universities and colleges around Zambia”, said Kamanya. And artSprouts Executive Director Mila Shelehoff underlined that during the first two weeks of operations, her organisation will engage in hands-on teacher training and Amos Youth Centre staff and student teachers will have learned how to nurture student's artistic abilities and help them appreciate art. The Foxdale Court Arts Day, an annual event held along Zambezi Road in Lusaka’s Roma residential area is surely proving to be a delightful addition to the arts calendar in Zambia. Designed as a small art fair in the shopping centres courtyard, it celebrates poetry, music, drama, dance, handicrafts and the visual arts. It also promise as a potential hive for family fun with its Kids’ Corner. 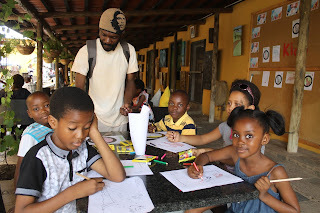 In the Kids’ Corner, children had the opportunity of working under the mentorship of visual artists Christopher Simbule and Sarah Chibombwe who encouraged the youngsters to work together; making collaborative works of art in small groups which were later displayed on a notice board. The youngsters were provided with free materials and they could be seen enjoying themselves for the entire duration of the event from 09:00hrs to 17:00hrs last Saturday. “I’ve had a lot of fun here; I’ve made lots of new friends. I used all my favourite colours when making a painting with them,” said Nsama Mulenga a grade 3 pupil at Nachingwa House School. 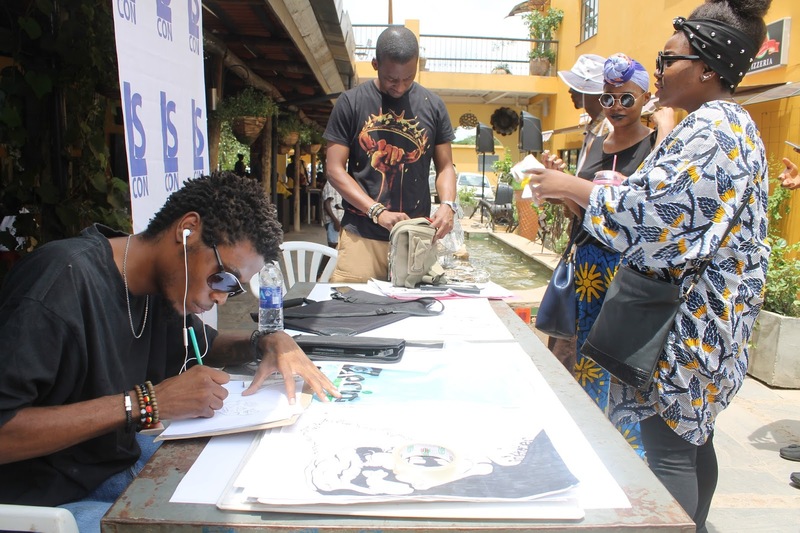 Another popular spot at the event was the LsCon stand which featured live drawing by talented young Zambian cartoonists. 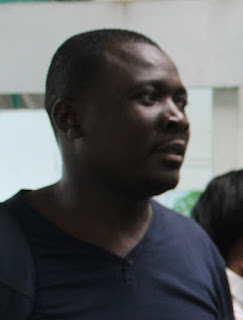 Present were the likes of artist Jarell Thompson who has done some story boards for a Zambian animated movie, Mwelwa Musonko creator and illustrator of his own comic, The Sweeper, Chimwasu Njapawu who had a collection of caricatures of Zambian politicians and Bwanga 'Benny Blow' Kapumpa a freelance writer and content manager for Dagon Media. Kapumpa, who is also co-creator and writer of The Mundane Kid explained they were at the event to publicise LsCon, short for “Lusaka Comicon” an event founded by App-developer Mweetwa Singombe and inspired by the San Diego Comicon, brings together lovers of comic books, anime, video games, movies, global pop culture and visual arts. Scheduled for 30th April at Paark Xtreme, No. 24 Ngumbo Road, Longacres it is also aimed at showcasing the work of talented young Zambians who do not get a chance in the limelight. 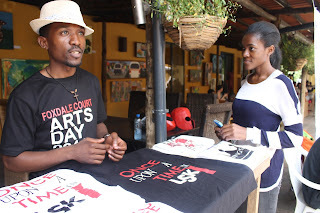 Chawe Jane Chisha, an upcoming artist who was found near the LsCon stand said she was excited at the chance to mingle with other creative people at Foxdale Court Art Day. “I’ve been shy to publicly show my work but having walked around this space, I feel encouraged to take up art seriously and not treat it as a hobby, I think it’s time for me to start showing my work in exhibitions” explained Chisha as she shyly produced a sketch pad which was filled with intricately detailed pencil drawings. is exactly what happened with the Foxdale display, however charming, it failed to make any sales on the opening day, nevertheless, in case you missed out, you can still catch a glimpse of the various paintings and sculptures which will remain on show in the courtyard for another week. All the pieces are up for purchase and the display features work by Aubrey Chali, Danny Lwando, Joseph Shakulipa, Mapopa Manda, Gilbert Nsama, David Makala, Kingsley Kapobe, Monica Muleya, Owen Shikabeta, Mwamba Chikwemba. Samuel Kasongo and Roy Finnie. Foxdale Court Art Day is organised and sponsored by the shopping centre management, and organised in conjunction with in conjunction with the Visual Arts Council and National Carts Council, the opening cocktail on Friday 26 February was supported by Carling Black Label and Fortress Media while the event was officially opened by National Arts Council Chairperson Mulenga Kapwepwe. Foxdale Court has expressed the need to purposefully create more platforms for artistic expression in the country and Managing Director Angelika Nyboe Andersen said that it is necessary to provide platforms for artists to showcase their work and enable them to network with likeminded individuals from their industry as well as share their work with the general public. “As Foxdale Court we are happy to provide an alternative platform for artists to exhibit their work. We see ourselves not merely as a commercial development but also as a creative hub,” she said. She said Zambia needs to proactively support the arts in whatever way they can as art can be an alternate way of generating incoming and contributing to the country’s economy. Foxdale Court has in the last year hosted other artistic events such as Fashion Day Out in October last year, Aperitivos and also hosted Bongohive’s Meet the Industry events. In Zambia, the arts have been espoused with tourism under an umbrella ministry for just over two years now, however, in art circles there is still an air of disappointment coupled with a commonly held belief that the ministry pays more attention to the tourism sector than it does the arts. But in an effort to break the ice and strengthen the relationship between tourism and arts, the Hotel and Tourism Training Institute Trust (HTTI), Zambia’s prime hospitality, tourism and travel industry training institute has launched an art awareness programme that involves study tours of museums and art galleries. 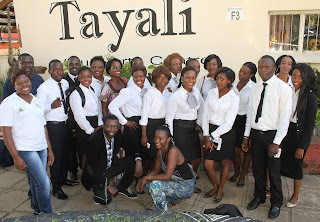 Last week a group of students and lecturers lead by HTTI senior lecturer-tourism, Jack Kaale visited the Henry Tayali Gallery and the Art Academy without Walls (AAWW) in the Lusaka show grounds. “For a long time we have not taken art seriously particularly in the tourism sector. But now we have realized that art is one of the most important products that we can use to enhance tourist operations. So we need to start marketing art particularly as an attraction. Fine, we have the Victoria Falls, but art is one important aspect that we can sell as a tourist attraction,” said Kaale in an interview at the Henry Tayali Gallery. Kaale explained that this was the groups second trip, the first one being a visit to the Lusaka National Museum. He said that HTTI hopes to create an inventory of museums and art galleries in order to see what they had to offer and to make students more well-informed so that they can be able to give museum and gallery tours as well as speak knowledgably about art. “There is a lot that we didn’t know. Surely, the product knowledge we have gathered during this trip will definitely help the students with the tour guide aspect of the course, it will also help them when they enter the industry full time. 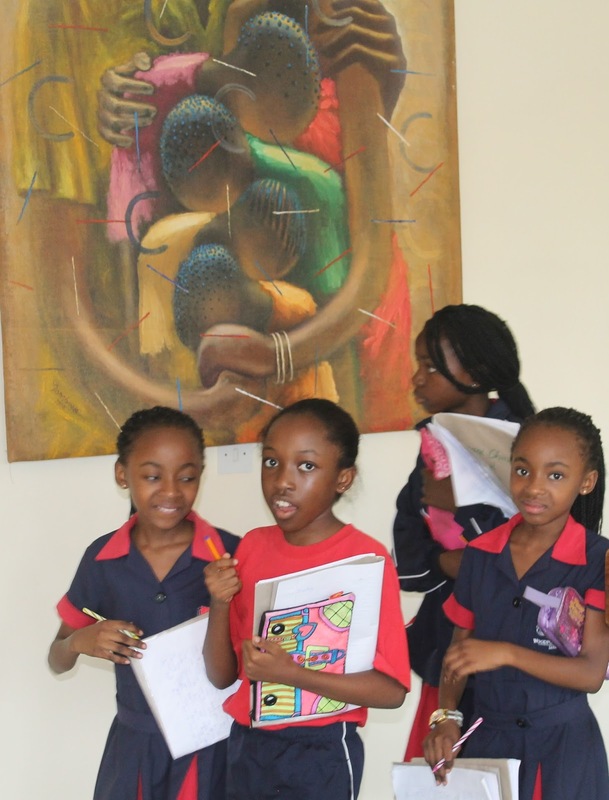 They will be able to conduct art tours,” he added. 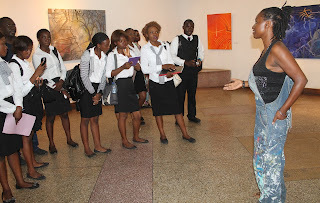 During the study tour, students inquisitively engaged the artists whom they found working. They quizzed the artists on everything from how they managed to survive on art alone to whether as artists they felt any benefit of being incorporated with tourism under one umbrella ministry. All the students appeared honestly interested in art, for many of them it was a first experience in an art gallery and studio space and during their tour of the AAWW were entertained to a soulful rendition of the hymn Yes Jesus Loves me performed by David Makala who was found working on a sculpture in readiness for a forthcoming exhibition. “To be honest, the trip has ended up being more interesting than I thought it will be. 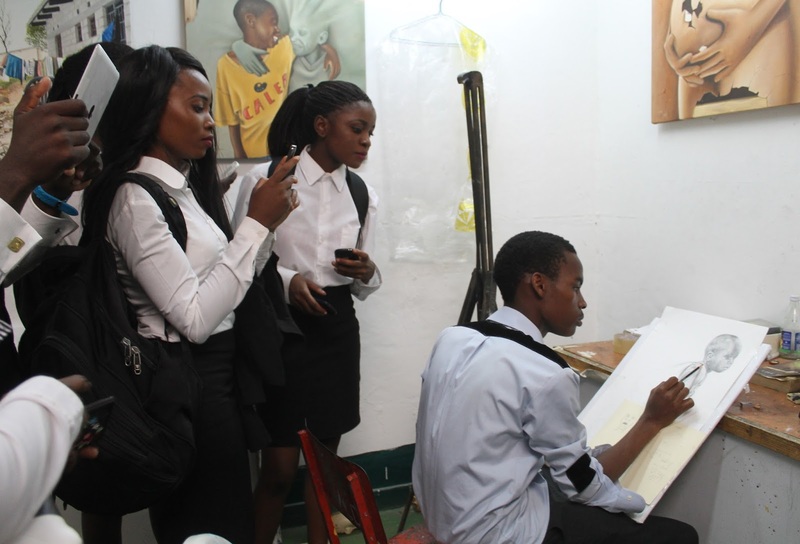 I’ve seen a lot of paintings that have inspired me to take a deeper interest in art, from now I can promise that I will be visiting regularly”, said Zangose Sakachoma a HTTI first year student. Mirriam Kaluba, another student concurred with Sakachoma and proposed that the art tours should not only be part of the study tour programme but should be a key component as part of the curriculum, the two students collectively suggested that art appreciation should even be included in their syllabus. HTTI is rated as one of the world’s leading hospitality training institutes offering courses in tourism, travel and IATA in association with the Fairview Hotel it also offers students hands on experience in handling accommodation, conferences, outside catering, banquets and the culinary arts. Its traditional Zambian cuisine served from Monday to Friday is a crowd-puller. For the moment, today, Saturday 27th June, Foxdale Court along Zambezi Road in Lusaka’s Roma residential area hosts Arts Day 2016 from 9:00 - 17:00hrs. Scheduled for family fun, the event is aimed at celebrating visual art, poetry, music, drama and dance. All activities will take place in the court yard and entry is free. The show opens with music by Ngenda Konoso and Chembo, a poetry session with sculptor Charles Chambata, performances by Circus Zambia, live painting and sketching by Sarah and David with puppetry by Usher Phiri, viewing of artwork will be throughout the day, the display will feature a variety of works from leading Zambian visual artists. Meanwhile, Barclays Bank has announced a call for entries for the 2016 Barclays L’Atelier art competition for emerging artists aged 21 to 35. In a press release published by Barclays Africa Group Media Relations Manager Lexi Ball this week, the announcement states that the judges will be looking for ‘thought-provoking works that push traditional boundaries’. According to the release, Lerato Bereng, L’Atelier head adjudicator, states that bold and daring work will make the grade in this year’s competition where, with 10 African countries now participating, the stakes have moved higher. “This year we will be looking for thought-provoking and well-executed work that challenges and pushes boundaries. We are not only looking for pieces that demonstrate formal qualities, but rather for artists who really make us think,” states Bereng who is also an associate director at Stevenson Gallery in South Africa and a member of the finalists’ judging panel in two previous L’Atelier competitions. “Don’t hold back. That’s my advice; nothing is too much or too subtle. Artists should focus on why they are making that particular work, and the sentiment behind it, and bring that to life,” she maintains. In the same press release, Dr Paul Bayliss, Absa Art and Museum Curator, declares it is an exciting time not only in the evolution of the competition, but within contemporary African art as well. “In addition to South Africa, we’re delighted to welcome artists this year from Botswana, Zambia, Ghana, Kenya, Egypt, Uganda, Tanzania, Mauritius and Seychelles. It’s fitting the competition enters this new phase at a time when there is a lot of new energy fuelling our young African artists, and I hope this translates into exceptional entries this year,” states Dr Bayliss. Both Bereng and Dr Bayliss reiterate that the 2016 prizes present unrivalled opportunities for emerging artists. These include a six-month residency at the Cité Internationale des Arts in Paris (main winner); three-month residency at the Cité Internationale des Arts in Paris (Gerard Sekoto Award winner – for South African artists only); a three-month residency at the Bag Factory Artists’ Studio in Johannesburg (merit award); a two-month residency at the Sylt Foundation in Germany (merit award) and a one-month residency in New York (merit award). Barclays L’Atelier 2016 is hosted in conjunction with the South African National Association for the Visual Arts (SANAVA). Artists are reminded that the registration process this year is being facilitated exclusively online at www.lateliercompetition.com. Registration is open until 4 March 2016, and all entries must be received at your nominated collection point by 16:00hrs on this date. Entrants can make their drop offs at their nearest collection point between 29 February and 4 March 2015, Zambia’s collection point is the Henry Tayali Gallery.